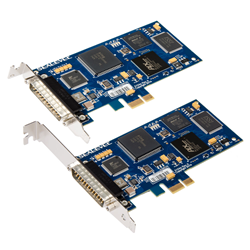 Sealevel's most requested sync product, the 5104e PCIe adapter is the evolution of the popular 5104 PCI sync adapter. A Z16C32 Integrated Universal Serial Controller (IUSC™) with on-chip direct memory access (DMA) controller and 32-byte first in, first out (FIFO) buffer coupled with 256K of on-board memory allows for burst data rates to 10 Mbps. The DMA controller supports a variety of data transfer modes including single buffer, pipelined, array and link list. For enhanced security, the 5104e includes an optional original equipment manufacturer (OEM) security feature to prevent unauthorized board use in an application. To ensure successful communication application development, synchronous serial software support is provided through Sealevel’s SeaMAC V5 synchronous serial driver. HDLC and SDLC protocols are supported, as well as certain configurations of monosync, bi-sync and raw modules. Existing PCI customers simply need to update to the latest SeaMAC software driver for seamless operation of their existing synchronous serial application. The 5104e, priced at $649 with standard and low profile bracket options available, is available from stock. For more information, visit sealevel.com or call +1 864.843.4343.